I stood there. In awe. In front of That. Couldn't move my eyes off That. The tears started flowing. Tears that must flow when your heart is so full, so very full that it just doesn't know what else to do. It melts through your eyes. These are the moments when the mind doesn't know what is going on. The mind just goes out of the picture. Thankfully. And you are there simply in that moment of oneness with That. With the Spirit of That which is in front of your eyes. Like that afternoon of August 2012, when I stood in front of the bodhisattva Padmapani at Ajanta Caves (cave 1). What an extraordinary experience it was! There were many people in the cave, admiring, whispering, talking, taking pictures, strolling about. But all of them, all of that disappeared. Sort of. And there I was, frozen at the spot, right in front of the over-life-size Padmapani, painted on the wall of the cave. And the tears wouldn't stop. What I felt was and still remains indescribable. But that's because describing is the task of the mind. There was no mind involved in what I was feeling. Or at least that's how it feels even after two years. The only word that comes to mind when I recall that experience is - Gratitude. For that Experience, that Moment. For those Artists who have given us such Works of Art. Art that is not only to be enjoyed on the surface. It can't be because it doesn't reveal itself fully on that level. It has to be felt, experienced in a different way. 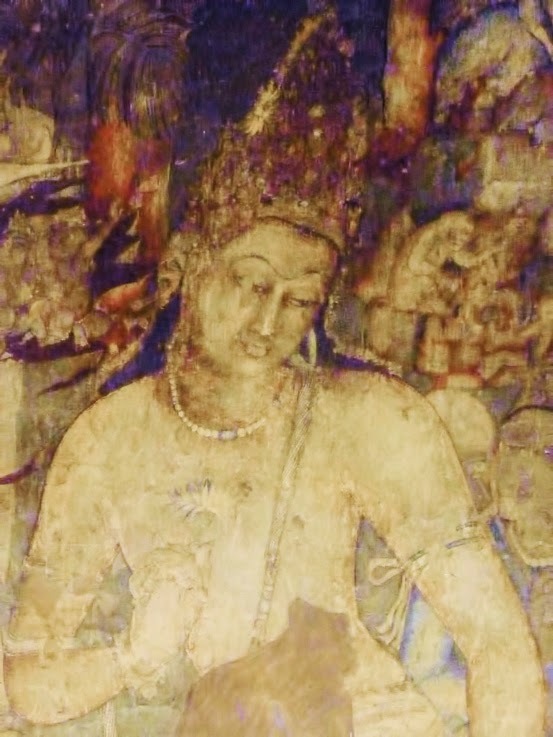 ... the unique character of Indian painting, the peculiar appeal of the art of Ajanta springs from the remarkably inward, spiritual and psychic turn which was given to the artistic conception and method by the pervading genius of Indian culture. Indian painting like Indian architecture and sculpture appeals through the physical and psychical to another spiritual vision from which the artist worked and it is only when this is no less awakened in us than the aesthetic sense that it can be appreciated in all the depth of its signiﬁcance. Linking this post with ABC Wednesday, X: X is for Extraordinary.